And there’s the catch. I am still alive because I am a patient at not just a good hospital, but a really great hospital, a hospital where so far, research has managed to stay one step ahead of my cancer. Well, that really great hospital has gotten even better. 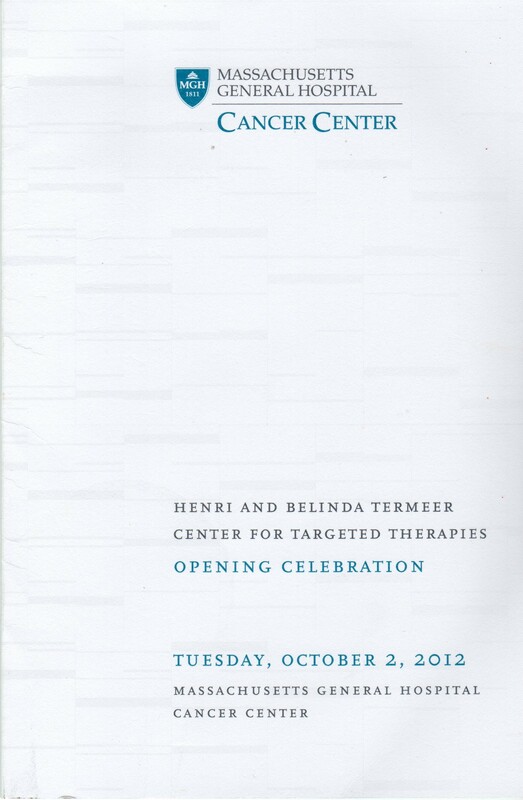 On Tuesday I attended the opening of the Henri and Belinda Termeer Center For Targeted Therapies. The event began with a symposium in the Ether Dome, located in the Bullfinch Building at Massachusetts General Hospital. 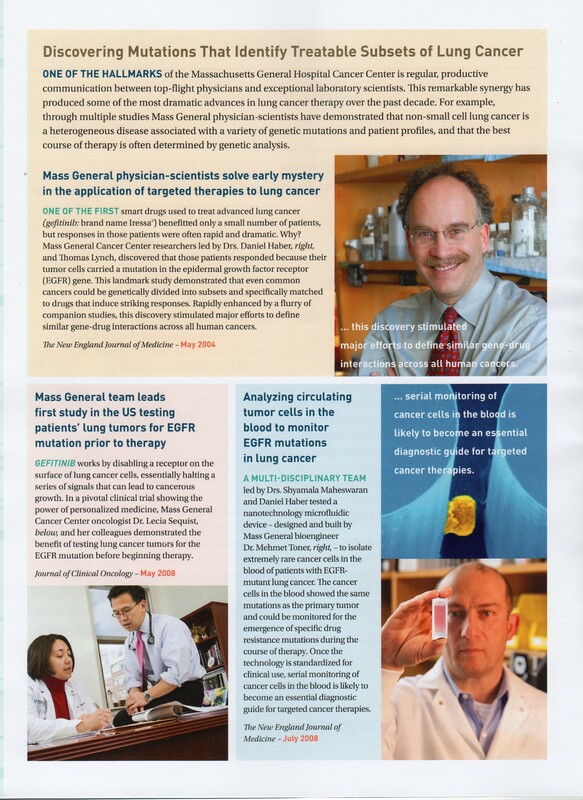 Dr. Jose Baselga (who is leaving MGH to take over the helm as Physician-in-Chief at Memorial Sloan-Kettering Cancer Center) spoke of the impact targeted therapies have had in the redesign of clinical trials. Dr. Robert A. Weinberg, who was instrumental in the isolation of both the first human oncogene, ras, as well as Rb, the first known tumor suppressor gene, addressed the natural evolution from early identification of oncogenes to the development of targeted therapies. And then Dr. Keith Flaherty, now the Director for the Henri and Belinda Termeer Center For Targeted Therapies, described the role the center would play, both clinically and in the research setting. We were then treated to a tour of the center, which is located on the 7th floor of the Yawkey building. I had expected just an expanded laboratory, but it is an entire unit dedicated to phase I clinical trials, with sparkling new private rooms boasting windows to the outside world. The evening concluded with a moving testimonial from John Murphy, an early participant in a trial for patients with melanoma. And of course a few words from Henri Termeer ( the former president, chief executive officer, and chairman of Genzyme Corporation), who along with his wife Belinda, are the generous donors who made the center a reality. My feelings that evening could be summed up in three words: awe (of the company I was momentarily keeping), gratitude and hope. Those of us with cancer are supported by an entire army of truly brilliant, incredibly dedicated and endlessly resourceful individuals who are simply not going to back down. Cancer, you are in for a hell of a fight. I had my appointment with Alice (Dr. Shaw) on Monday, and we were able to view the images of the before and after scans together. They do indeed appear much improved. In my left lung, there remains a hazy footprint of what was formerly an area of consolidation. It could represent inflammation or, possibly more likely, unresolved cancer. The right lung (my ‘good’ lung), looks almost entirely clear. It is important to remember at this point that A. we are in the dose escalation phase for LDK378, and the therapeutic dose may not have been reached yet, and B. this is not my first exposure to an ALK inhibitor and my cancer had acquired resistance to crizotinib (Xalkori). All in all–a very respectable response. We will be watching my next set of scans closely and also positioning for dose escalation as soon as possible (there are certain constraints per protocol–and it will be six weeks or so before escalation is a feasibility). Update–Alice received the measurements for resolution (which is factored in a way that is very reliant on degree changes in borders of tumor rather than density) and it is 19%. This is a good place to remind all that I learned a long time ago not to be defined by numbers. I prefer qualitative to quantitative analysis, and symptomatically, I am much improved. I have been feeling well for the past week. My cough has resolved, my energy is up and the chills are gone. All good signs. This past Monday I underwent the bronchoscopy. Quite uneventful aside from the nasty numbing stuff they squirt up your nose and down your throat prior to the exam. “This is going to feel like you’re drowning” counseled the attending nurse with no apparent irony. And it did. On Thursday I was back in Boston for my chest CT scan. Although I’d been given a bye on barium for the past two years of the crizotinib trial, I am once again required to drink two ‘milkshakes’. As I’ve explained in some previous detail, I am oblivious to most of the discomforts involved in my day to day medical care. You don’t even want to know how many times I get jabbed with a needle. However, I have never liked putting something in my mouth that I don’t want there. I am, in fact, almost phobic in this regard. Oral contrast is tough for me, and hopefully I can once again talk upper management out of the necessity of such an (onerous) detail. 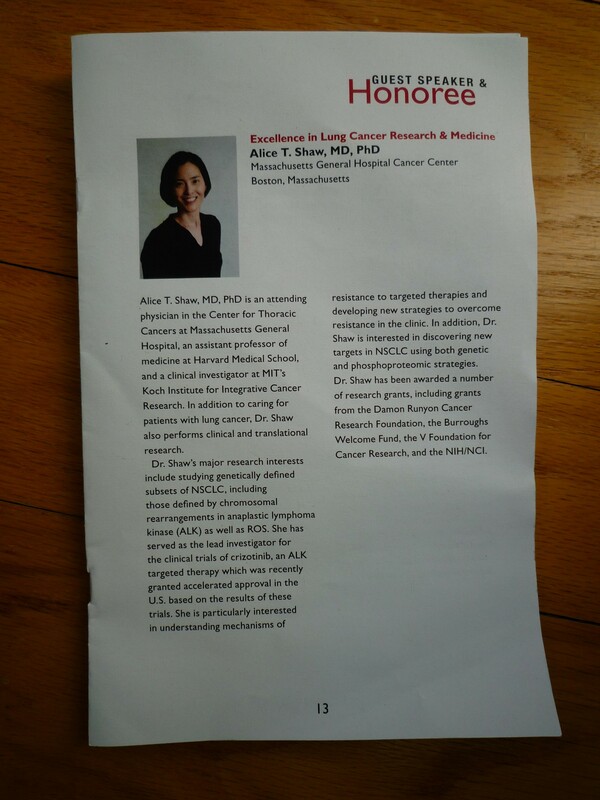 I had taken the bus in, and David picked me up at the hospital after my exam and we continued on to Randolph, where my oncologist, Dr. Alice Shaw, was being honored by the American Lung Association. 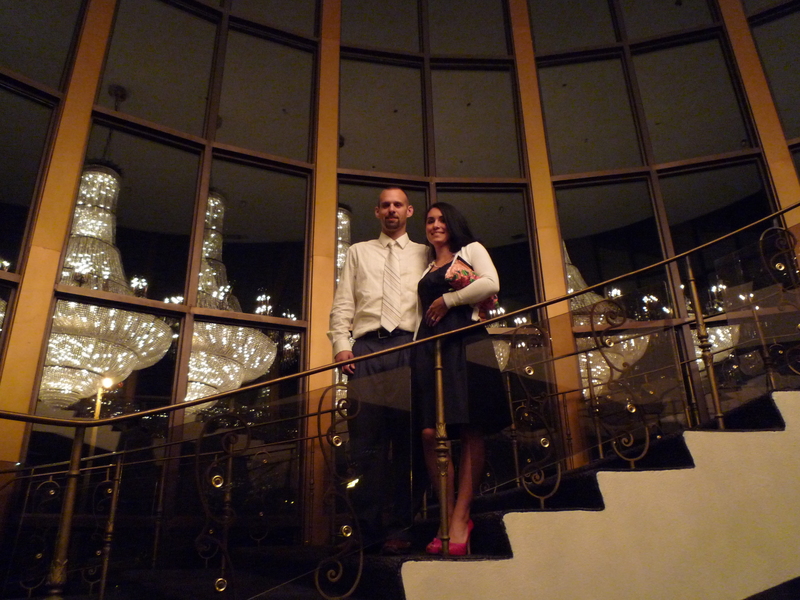 Also in attendance were three of Alice’s other patients, including Chris and his wife Karen, pictured on the rather dramatic staircase of the venue. They have an adorable daughter who is just two, and Chris has done quite well on crizotinib. I wish him many more years of success. Lines/tubes: None. Lungs and Airways: There is improved consolidation in the left upper lobe and lingula with residual ground-glass opacities, which had been previously chronic and progressive and are considerably improved from 8/31/2011, consistent with improvement in lymphangitic carcinomatosis. There is a stable 3-mm nodule along the minor fissure. The surrounding smaller nodules have resolved. Pleura: There is a stable small left pleural effusion. Heart and mediastinum: The thyroid gland is normal. No significant mediastinal, hilar or axillary lymphadenopathy is seen. The heart and pericardium are within normal limits. There is mild pericardial thickening, which appears more prominent compared to 8/31/2011. History of non-small cell lung cancer status post left lower lobectomy. Improvement in lymphangitic tumor spread in the left lung. Stable indeterminate 3-mm nodule along the minor fissure. Slightly increased mild pericardial thickening. I like how many times improved or a variation thereof is used in the first paragraph (three), and the addition of considerably is even better. Stable appears twice in the second paragraph. And in IMPRESSIONS, the key words are improvement, stable, and slightly increased. This is a very good, considerably improved, report. Yippee! lymphangitic carcinomatosis: A condition in which cancer cells spread from the original (primary) tumor and invade lymph vessels (thin tubes that carry lymph and white blood cells through the body’s lymph system). This is the definition from the National Cancer Institutes online dictionary. From Medscape reference we get this explanation: The lungs are one of the most common targets for metastatic disease. Most pulmonary metastases are nodular, but a significant minority is interstitial. Lymphangitic carcinomatosis (LC) refers to the diffuse infiltration and obstruction of pulmonary parenchymal lymphatic channels by tumor. Interpretation? I believe it is simply another way to describe metastatic lung cancer. I also looked up the significance off mild pericardial thickening (the pericardium is the membranous sac enclosing the heart), and will discuss it with Alice before I attempt to interpret this finding. Bottom line; it is a very good report. I have to wonder if I really did have an infection that the latest course of levaquin vanquished. Whatever the underlying cause of my initial malaise as well as the less than stellar PET scan, it is now evident that the LDK378 is having it’s way with my cancer. I’m tripping over myself with gratitude, and well, excitement. The personal impact is obvious, but I’m focusing on the big picture as well; perhaps LDK378 will prove to be yet another viable treatment option for those who harbor an ALK mutation. That would be really be something. On Friday, August 26th; crizotinib received FDA approval. It is now called Xalkori. Nice little features on both the ABC (scroll down to find Xalkori) and NBC evening news a couple of nights ago. 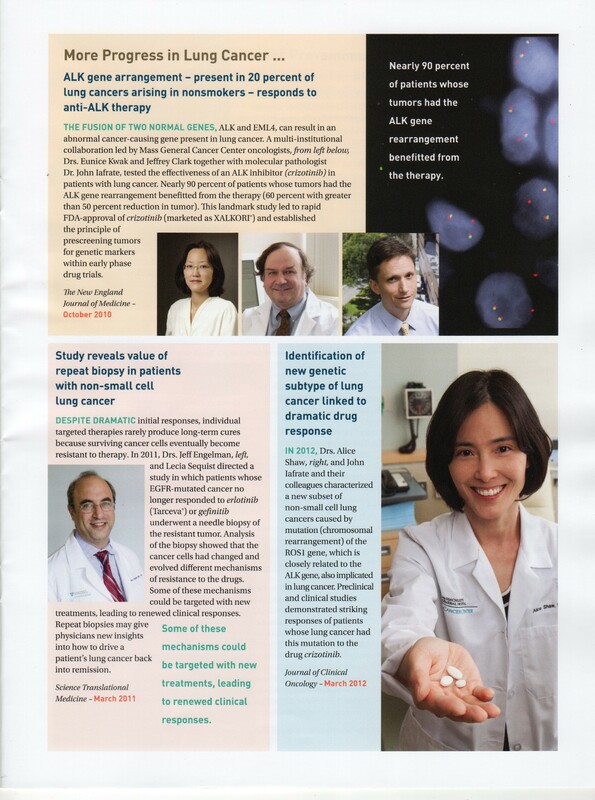 That’s my oncologist/goddess Dr. Alice Shaw providing commentary, and in the NBC piece, the images of the before and after chest CT scans are my lungs (an online friend recognized them and emailed me!). They do get around (my lungs and Alice). 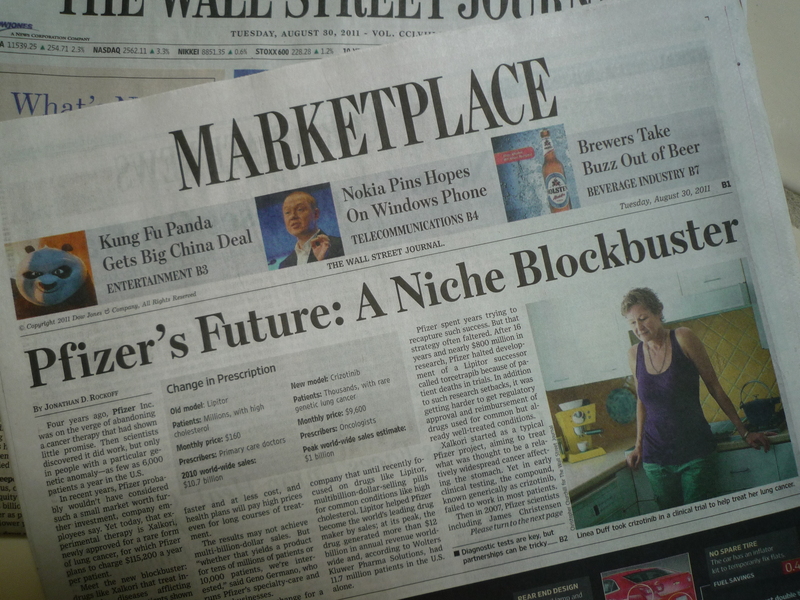 I should also mention that there was a story about Pfizer’s coup in the Wall Street Journal on Tuesday with a picture of and a few quotes from yours truly. My Dad Ollie, who read the WSJ faithfully, would have been pleased to see me there. I’ve noticed some criticism on the blogsphere, as Xalkori comes with a hefty monthly price tag ($9600), but Pfizer has taken steps to provide financial aid for those who need it. Also called out has been the fact that only 4-6% (or according to this latest data, almost 10%) of people with NSCLC have a mutation of the ALK gene. However, there are so many cases of lung cancer world wide (according to WHO, 1.4 million deaths yearly from lung cancer), that when you do the math, it is a truly significant number of patients who shall potentially benefit. So yes, Xalcori is big news for Pfizer as well as those of us with lung cancer and the FDA is to be applauded for streamlining the often ponderous approval process. And now, on a more personal level; what’s up with me. On August 19th I took my final dose of crizotinib (Xalkori). I am now ‘washing out’ in preparation for my next party trick (make that a miracle). Yesterday I peed in a cup, had bloodwork, a physical, an EKG, a chest and abdominal CT (with contrast–blech) and a PET scan as well. I was given one of those nifty cards identifying me as residually radioactive for 24 hours (just in case I encountered someone with a geiger counter). I am scheduled for my lead in dose of LDK378 next Wednesday and that’s when the circus really starts. In the meantime, I am feeling pretty crappy. I saw Alice (Dr. Shaw) yesterday, and she thinks that quite probably, the crizotinib was still conferring some protection, which is good news if in the future we want to add it to my arsenal again. Now that I’m off treatment, my energy level has really dipped and my shortness of breath is catching up to me. Today I made myself go on a walk, as I’ve been breaking my own rules lately (never stop moving). It was also Peter’s first day at the Academy, and he’s going to require a lot of support as he adjusts to a very rigorous academic schedule, so I’ve got to stay on my toes. What can I say? It is a stressful time for all of us, but we are doing our best to stay positive and hopeful. Because that’s how it’s got to be.